Emptied boat; middle 'spant'; W 'spant'; rivets in E end of boat; and S section in trench extension. Artefacts during conservation. Decorated whalebone plaque. Emptied boat with position of rivets marked in yellow. 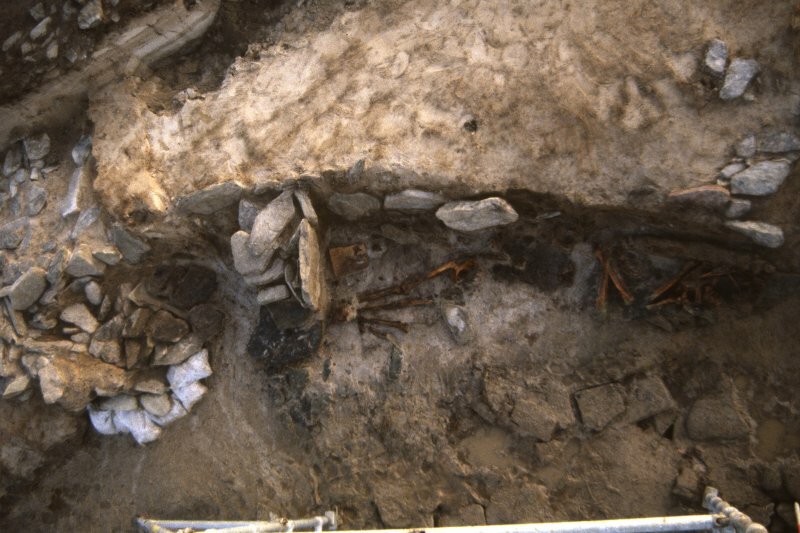 A section through the boat burial with W chamber in the foreground. Excavating the boat burial. The skeletons and the whalebone plaque are visible. Upper layers of sand removed from the boat burial. Excavating Scar boat burial under difficult rescue conditions. 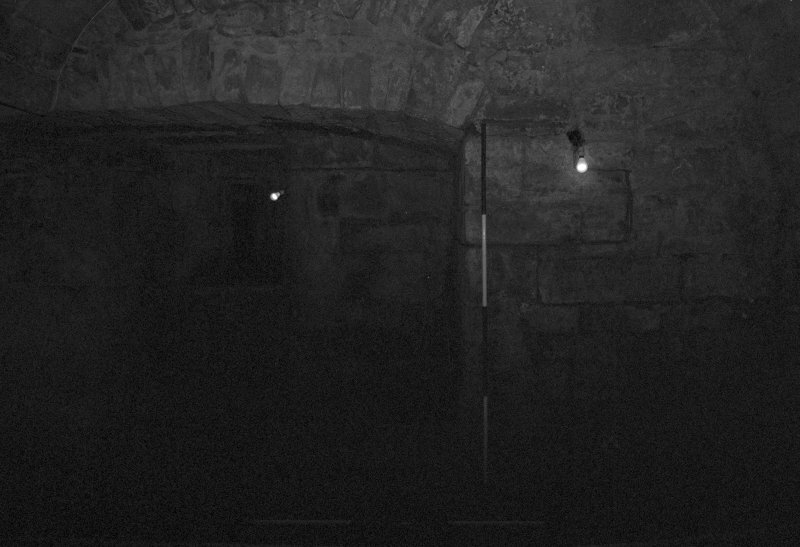 The W chamber, with the male skeleton and finds exposed. Bones from the boat burial eroding from the sand dune. 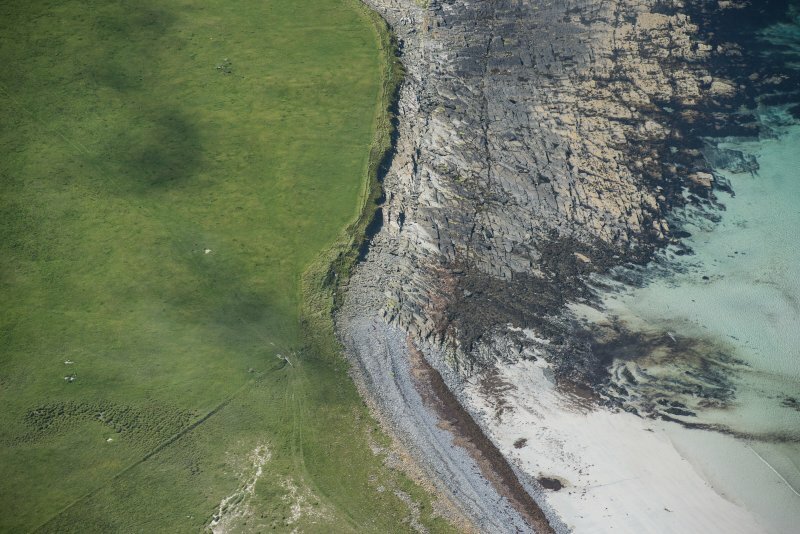 In 1991, coastal erosion revealed a Viking burial at Scar, Sanday. 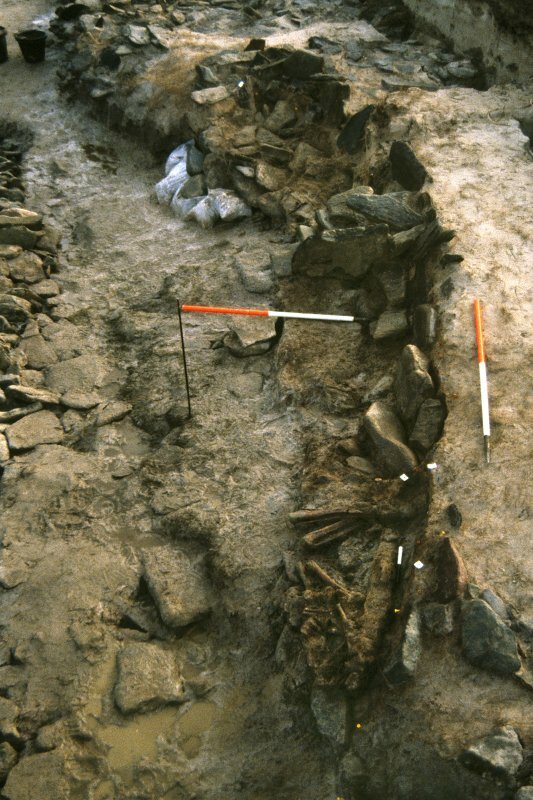 The burial was of a type known as a boat grave and contained three individuals; an elderly female, an adult male and a child of around ten. 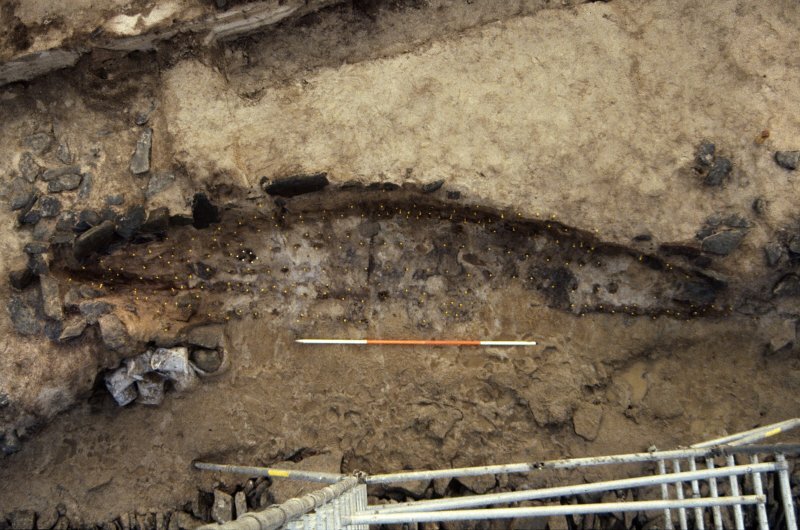 Excavation of the site showed that it comprised a seven metre-long boat, which had been deliberately placed in a pit that was aligned E-W. Large stones filled the eastern end of the boat, creating a chamber at the western end into which the bodies had been placed. The grave goods found indicate that this was an important burial. Several high-status objects were discovered, including a decorated whalebone plaque that survived virtually intact. Dating evidence suggests the burial would have taken place at the end of the 9th century AD. HY 6780 4584. 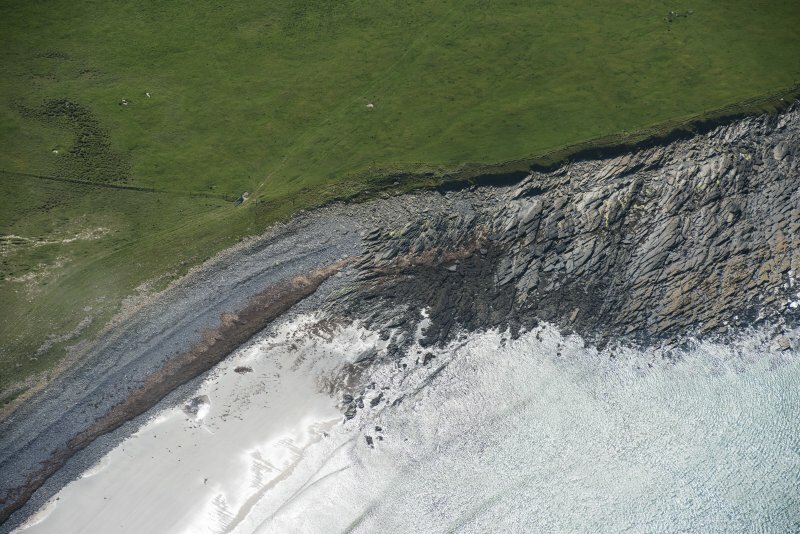 Mound, The Crook Beach: An irregular grassy mound 8m across and 1m high, with a section-end of a heavy dry-stone wall visible in its eroded seaward face. 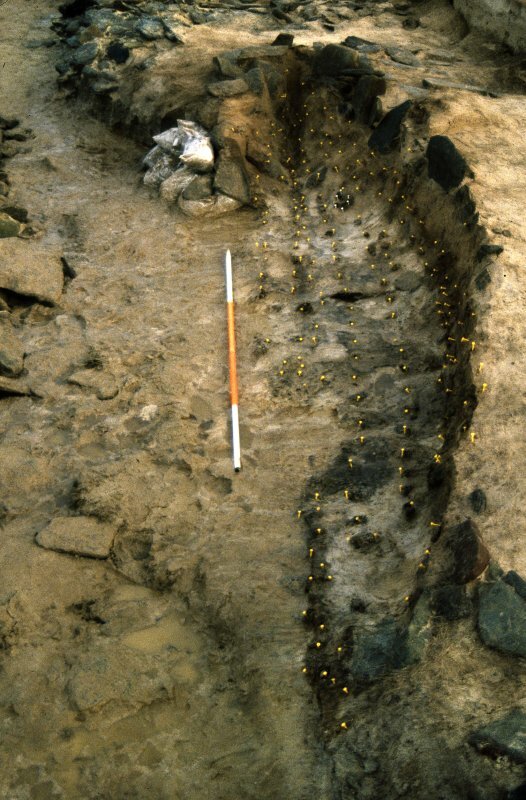 A Viking boat burial eroding out of a N-facing beach section 1km NE of Scar, was discovered in September 1991. The boat was excavated in November and December the same year by a team from Historic Scotland-Kinnaird Park. The boat was aligned E to W along the shore line. About one half of the boat had been washed away by the sea, but the S half of the boat still survived behind the beach section. 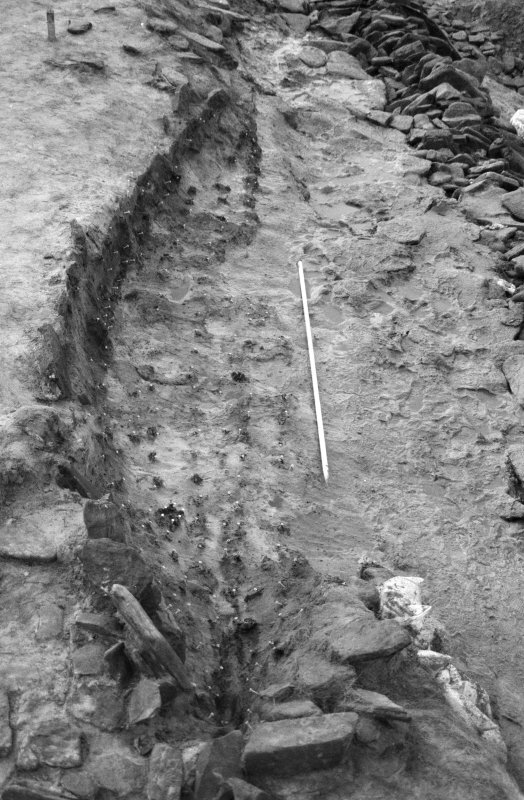 The shape of the boat was still visible by the pattern of rivets in the sand showing the positions of the individual planks in the boat. 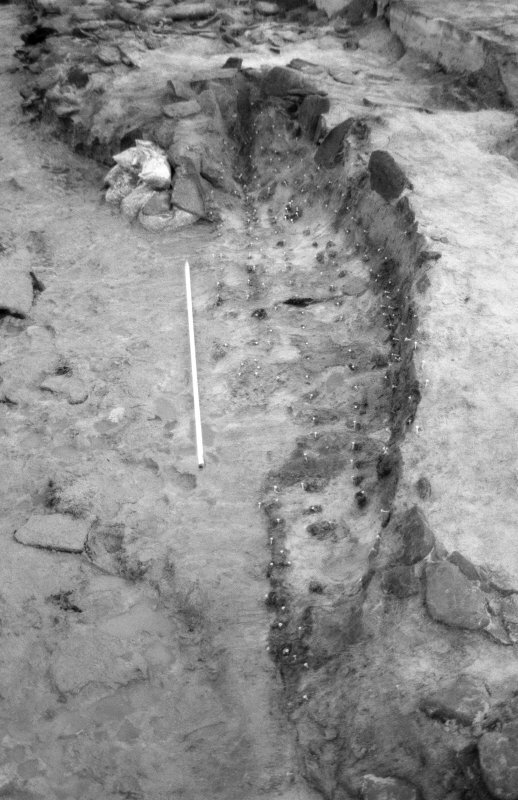 The boat was about 6.5m long, 1.6m wide, and 55cm to 60cm deep. A flagstone was set vertically across the boat, dividing it into two compartments. The E compartment, about one third of the total length, was filled with stones. The W compartment formed the burial chamber. The chamber contained skeletal remains of the bodies of a man, a woman and a child. The man, in the W end of the boat, lay on his back with his legs flexed and arms folded over his lap. On his right side was a sword (Petersen type H) set in a wooden scabbard, and a quiver of arrows. Between his hands was a composite comb made from bone and antler. Below his legs was a group of twenty-two bone or antler gaming pieces. The female and child were lying in a supine position next to each other, to the E of the male skeleton. Most of the bones from these two bodies had either been washed away by the sea, or been badly disturbed by animal (otter) disturbance. Between the female skeleton and the S side of the boat were two spindle whorls, a pair of shears, and several, as yet unidentified, iron objects. Some of these might be fittings for a wooden box which could have contained the shears and one of the spindle whorls. On the right-hand side of her feet, close to the E end of the chamber, was a decorated whalebone plaque. In the anticipated chest region of the female body was an iron sickle with remains of a wooden handle. This handle partly overlay an equal-armed brooch, lying upside down. The brooch was made from gilded bronze, with the needle and possible remains of textiles preserved in the corrosion products. The brooch was decorated with Borre Style gripping beasts. 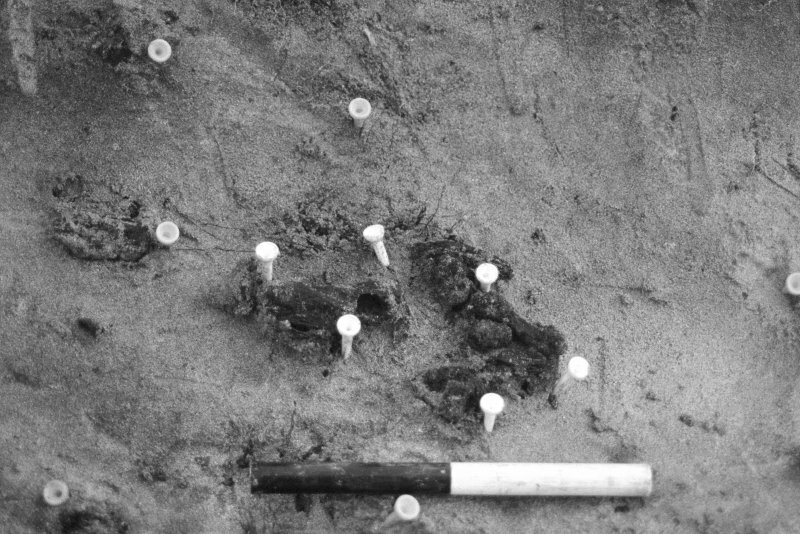 In the sand in front of the section two Viking lead bullion weights were found, indicating that the grave had contained a set of scales. In connection with the excavation, a geophysical survey of the land area along the shore was undertaken, westwards from the boat-burial. 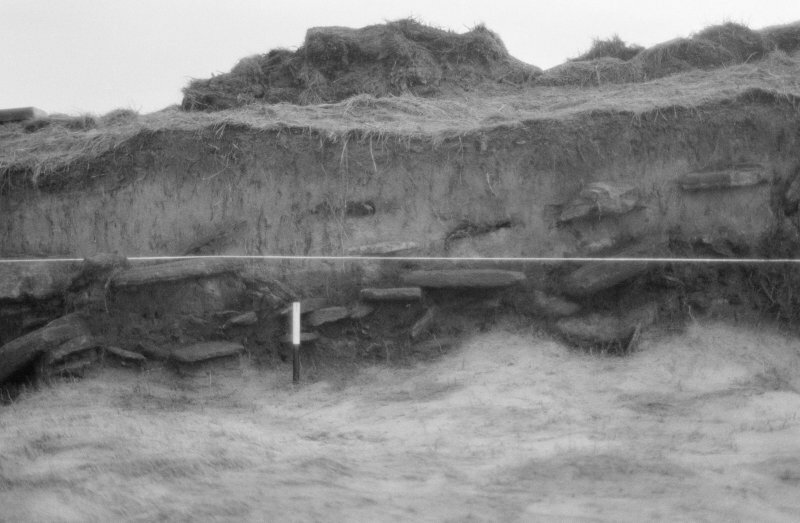 The survey revealed several anomalies of potential archaeological interest, but only excavation could determine if any of these elements are connected with the Viking boat-burial. Sponsors: HS, Orkney Islands Council. HY 677 458. A topographical survey was carried out by AOC (Scotland) Ltd of the area to the SW of the boat burial, to relate any topographical features with the anomalies recorded during the geophysical survey. 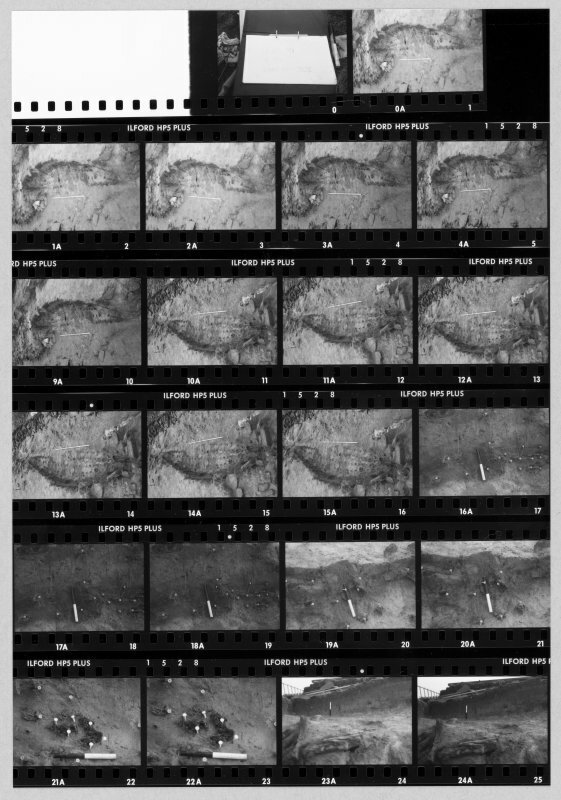 Some of the anomalies coincided with topographical features, but only excavation could determine if any of these elements are connected with the Viking boat-burial. 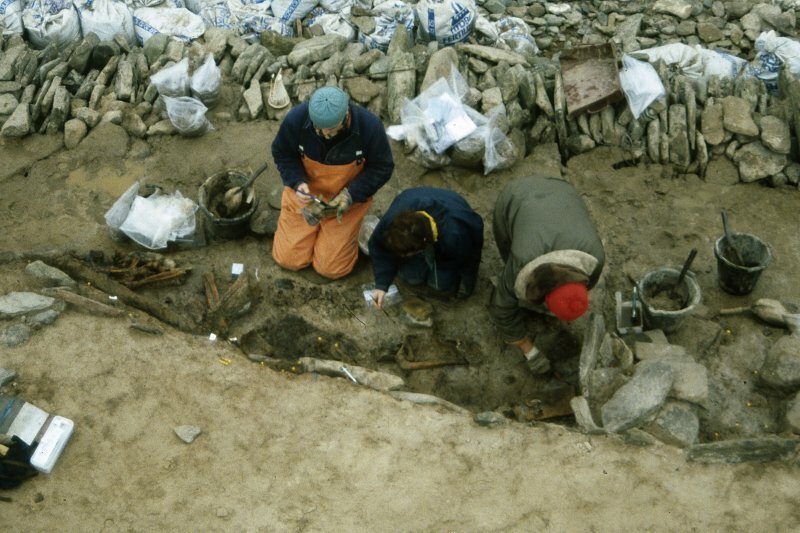 Scheduled as Scar, Viking burials and settlement. Information from Historic Scotland, scheduling document dated 27 February 1995. 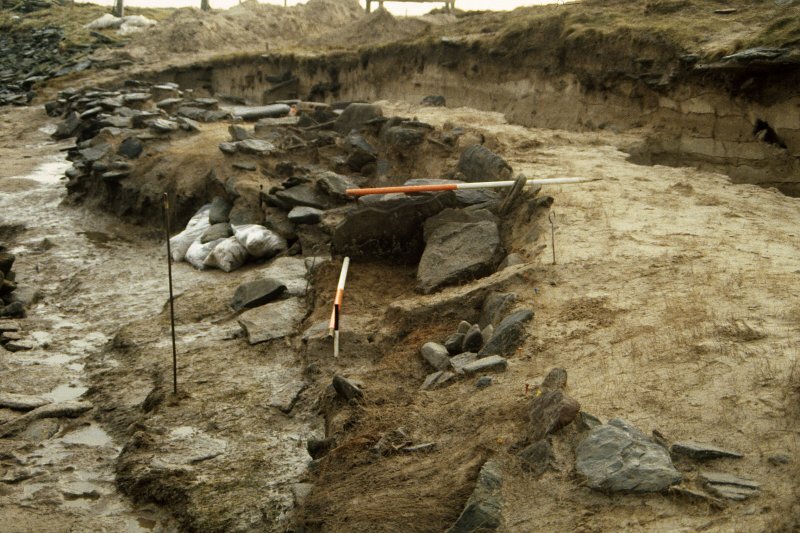 The archive from the 1991 rescue excavation at Sanday, Quoy Banks has been catalogued. The archive consists of manuscripts, photographic material and drawings. Historic Scotland Archive Project (SW) 2002. 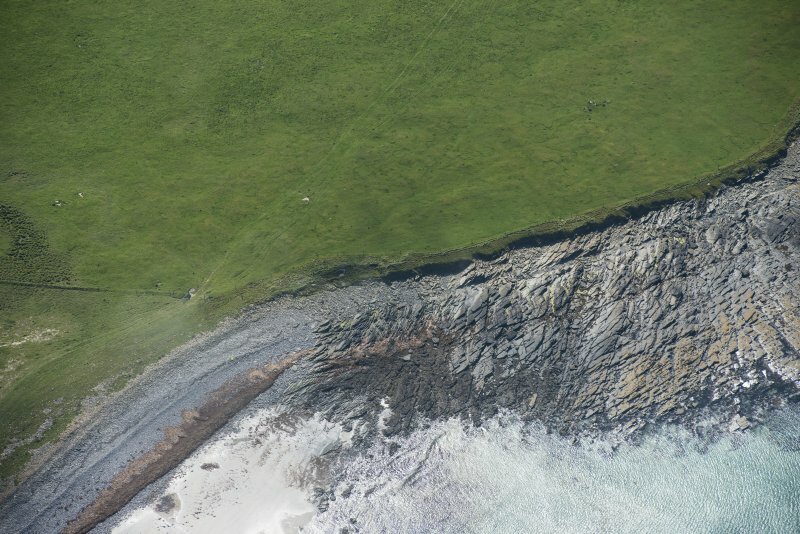 An elongated amorphous grassy mound lies close to the coast edge. Aligned north-south, it measures 20m in length by 10m in width and stands up to 1.5m high. There are some earthfast stones visible towards its summit. There are large quantities of blown sand in the near vicinity and it is possible that this feature may be entirely natural or that it may be very much exaggerated in size by the drifting sand. On a recent trip to Orkney I stood leaning into a storm at Skaill Bay, thunderous clouds above, sea thrashing the coast and such strong winds that I was literally blown off my feet. 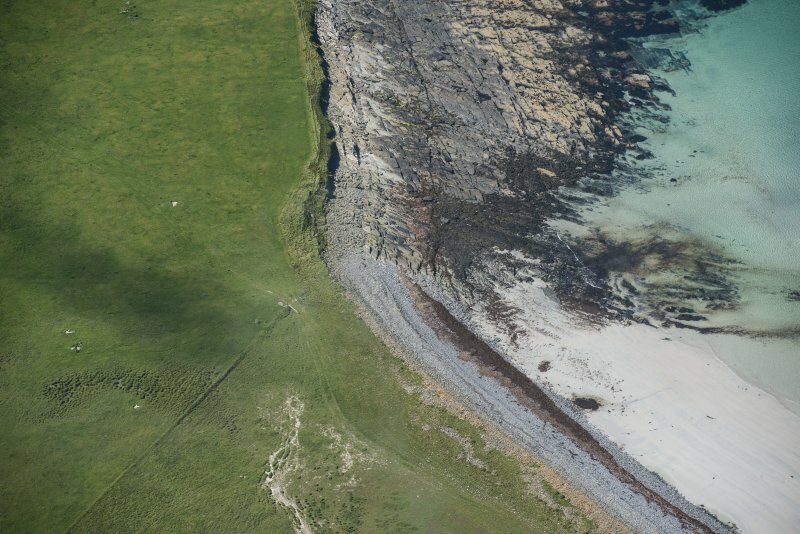 It was after just such a storm in 1985 that a farmer on the Orcadian island of Sanday discovered what he thought was the burial of a foreign sailor, a relatively common feature on Orkney’s coastline. Along with protruding bones the farmer noticed a small object which, some six years later (archaeological stories travel slowly), found its way into the hands of archaeologist Julie Gibson. During a visit to the site with Raymond Lamb she found a couple of rusted rivets, and the clues began to fall into place. The combination of rivets, human remains and the object – which turned out to be a small Viking lead weight used for measuring payments in precious metals – raised the possibility that the discovery was the burial place of a pagan Viking that had been laid to rest in a boat, a relatively common rite in Norway. 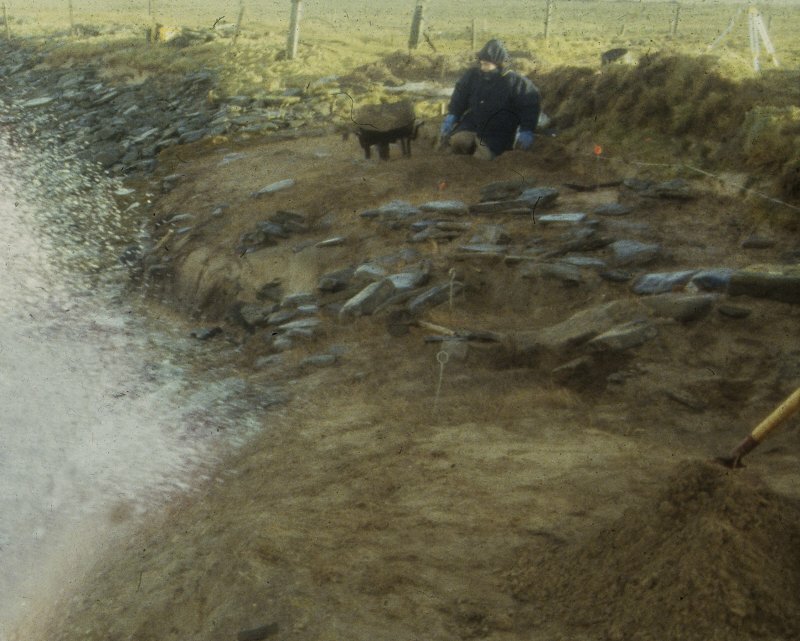 With the winter of 1991 coming all too soon, Historic Scotland agreed to organise a rescue excavation and the team, led by Magnar Dalland, reached Sanday during fierce October gales. A few days after the excavation finished, another violent storm removed the final traces. Three skeletons were recovered, apparently buried at the same time: a woman in her 70s, a man in his 30s and a child of about 10. Now housed in Orkney Museum, the wealth of finds which accompanied them to the afterlife included a magnificent whalebone plaque, perhaps devoted to the goddess Freyja, an unusual gilded bronze brooch, a sword, eight arrows in a quiver, and a set of gaming pieces for the board game hnefatafl. Everyday items included spindle whorls, a sickle, and even two needles with thread still wrapped around them. The timbers of the boat itself were poorly preserved, but its form could be reconstructed from over 300 iron rivets and nails that had held it together. Certainly a boat rather than a ship, it measured some 7.1m in length and was fashioned from oak and pine. Although some 50% of the boat and contents had been washed away, the preservation of many of the surviving items was exceptional. Unusually there was a conservator on site during the whole excavation and great efforts were made to lift each artefact without damage, thus ensuring that scientific analyses could be realised. Even textiles survived, and five or more different weaves were found on fragments of clothing and furnishings. Careful conservation and reconstruction of the brooch revealed it to be one of the finest and most complete examples from anywhere in the Viking world. 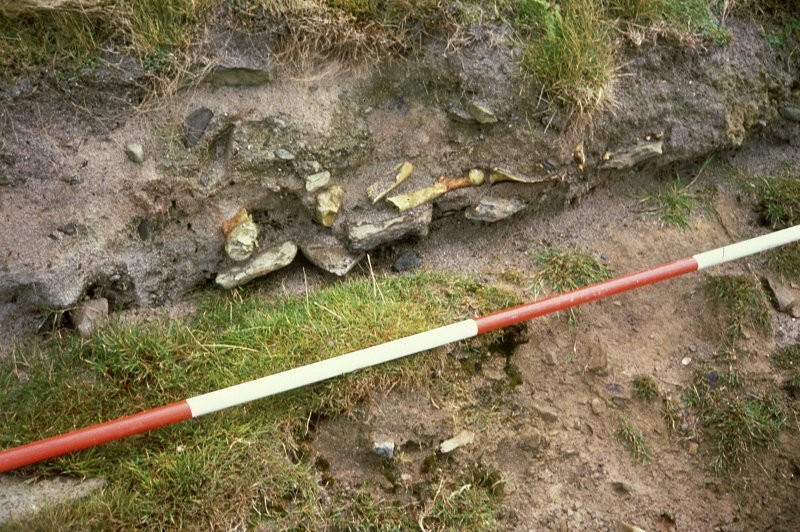 The date of this rich and diagnostically Viking burial has proved difficult to pin down. 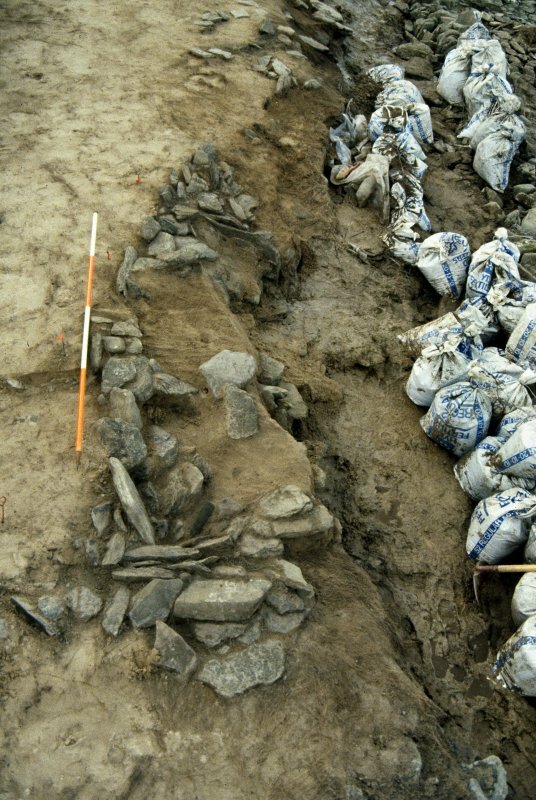 On the one hand, many of the well-preserved finds have close artistic parallels in Norway, and the excavators were convinced that on balance they pointed to a relatively early date (about 900 AD). On the other hand, a small suite of radiocarbon dates suggested a date as much as 130 years later. The excavators favoured a date of AD c875 to 950 arguing that some of the artefacts included as grave goods may have been quite old at the time. Since the woman died in her 70s, it was perfectly possible that heirlooms had been handed down from her mother or grandmother, and made in Norway many years before. The brooch itself may have been of some antiquity before it was buried. It was never established why the three individuals died but the lack of any positive evidence led the excavators to propose that they succumbed to drowning or disease, dying together or just a few days apart. Had it not been for the action of John Deerness, the farmer at Scar who discovered the site in 1985, their bodies and the beautiful belongings that they were buried with would have been washed into the sea. John wasn’t far from the truth when he thought the site may be the grave of a foreign sailor, but he could not have guessed at the richness and variety within this small pagan burial of 1000 years ago. Next time you’re in Orkney, and one of those inevitable storms rolls in, just think about the rich discoveries still to be made, and those archaeologists that will rush to rescue them.